I love blueberries-they are my absolute favorite fruit. I like to snack on them, put them in yogurt, and of course bake with them! Unfortunately for me my youngest son has inherited my love for blueberries and for a three year old, he can really put them down. It’s rare these days that I can buy them and actually get a few myself…he’s been known to eat an entire pint in one sitting. 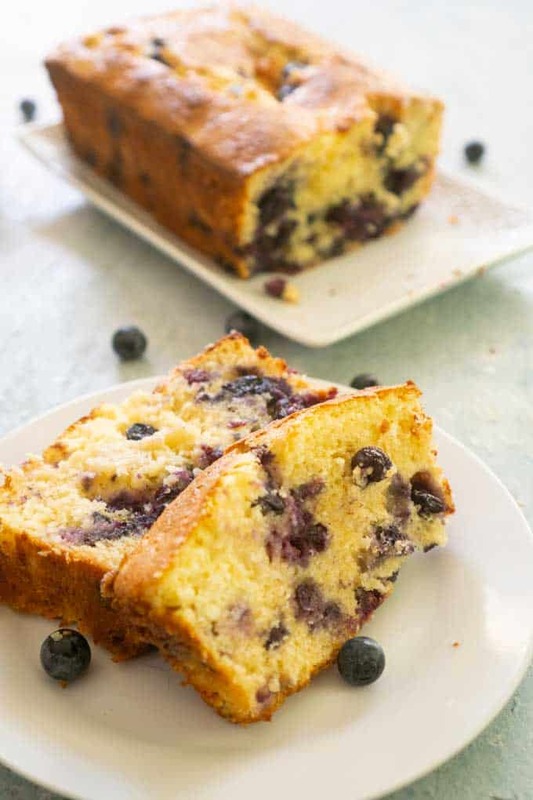 I wanted to make this blueberry cream cheese bread a couple of weeks ago and I had to get stealthy with the blueberries. I had my husband secretly add them to the cart at the grocery store then hid them in the very back of the fridge when we got home. I was caught during the baking process but I was adding them to the batter already so I got away with it. He was more than a little eager to try the bread out for me after it baked-there were little hands reaching into the pictures I was trying to take! Preheat oven to 350 degrees. Spray 6 mini loaf pans with nonstick spray. In a stand mixer, combine cream cheese, sugar and egg until uniform. Set aside. In a stand mixer combine butter and sugar and mix at medium speed for 3 minutes or until fluffy. Add salt, vanilla and eggs mixing well between ingredients. In a separate bowl combine flour and baking powder. Add half of flour mixture to batter. Add milk to batter to thin. Add remaining flour mixture and mix well. Batter will be thick. 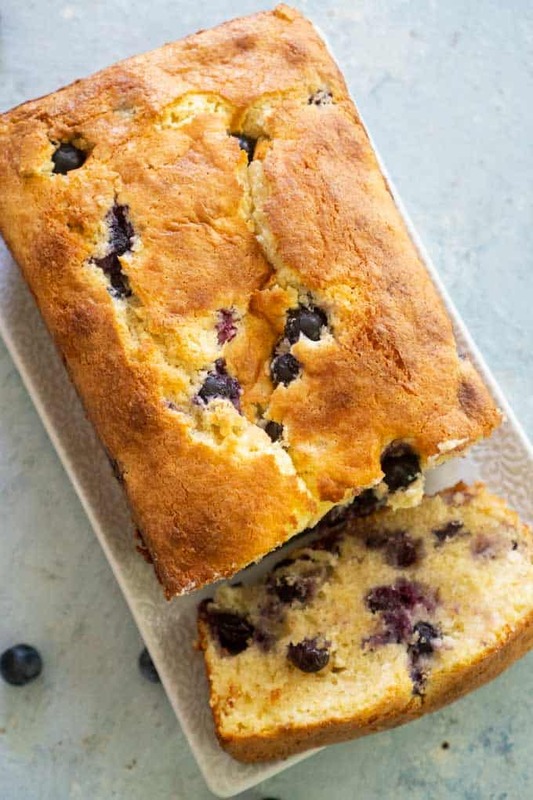 Remove from mixer and fold in blueberries. Spoon batter into loaf pan until half full. Top with cream cheese mixture and more batter. Bake for 35-40 minutes or until tops are golden brown. Remove from oven and allow to cool 20 minutes before removing from pan. Refrigerate bread and keep up to one week. As you might notice this is one recipe where low fat dairy is going to make a difference in the taste-I tried to “skinny” it up but the flavor just wasn’t the same-they were still good but not as rich. You can also make this as one larger loaf and cook for 55-60 minutes as well. 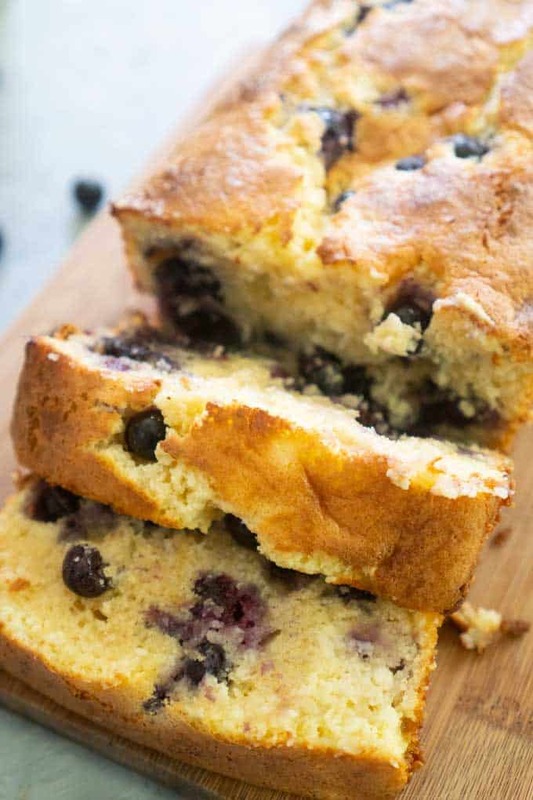 I hope you enjoy this recipe as much as I do, for another of my favorite blueberry recipes try these bakery style blueberry muffins! 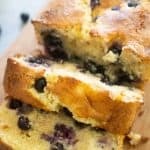 This delicious Blueberry Cream Cheese bread is rich and flavorful, perfect alongside your morning coffee! « Ultimate DIY Gift Round Up! previous post: Ultimate DIY Gift Round Up! Oh my gosh, this looks so delicious! I will definitely be trying this soon! This looks AMAZING, Melissa! Can’t wait to make a batch of these cute little loaves for breakfast! Is there a “Print” prompt anywhere? Hi Joyce, I updated the post with a printable recipe at the bottom for you! I hope you like it! Wonderful and thank you! I love it when the image comes with the recipe. Wow…that bread looks amazing! I can’t wait to try this yummy recipe. Thanks for sharing. PINNED! Eggs are listed twice in this recipe. Is there a reason for this? In the instructions do you add 1 egg in step 2? And then the other 2 eggs in step 4? Could this be made in a regular size loaf pan? Any suggestions on adjusting baking time? I need to know too… can I just make it in a regular load pan??? thanks so much! Getting ready to bake now! Made these last month and they were delicious. Now I want to make more to share for Christmas. Can i freeze?